Harvest Moon Papiere: Wow Blog Hop! Hi! 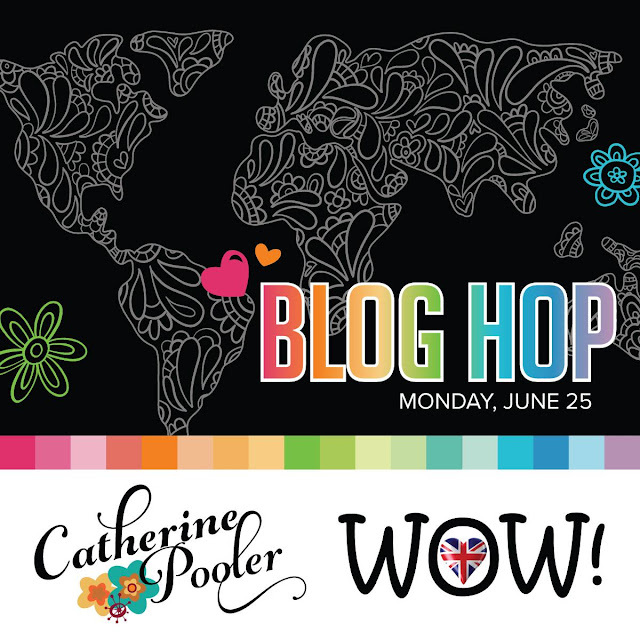 Welcome to the WOW Blog Hop! You should have arrived here from Ashlea's blog! 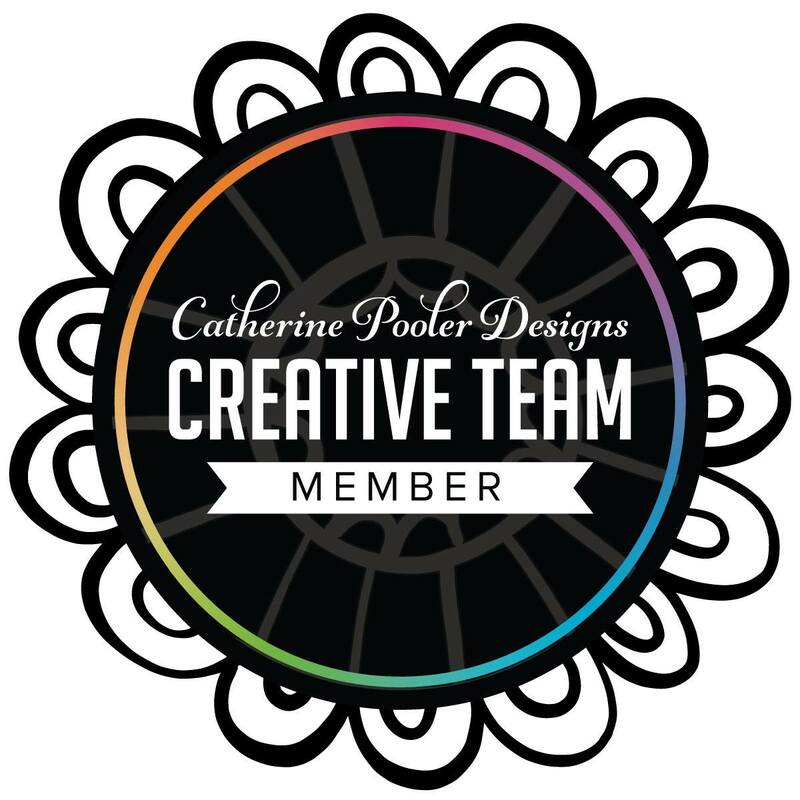 Catherine Pooler Designs is giving away one Set of Life of the Party Inks (Party dress, Tutti Fruitti, Tiara, Tiki Torch, Lime Rickey, Aquatini, Something Borrowed, Flirty Fuchsia)! For this card, I used WOW embossing powders Silver Pearl (in the background) and Bright White Superfine (for the sentiment). I loooveee the way that Silver Pearl looks on the Sand Dunes cardstock using the Swoop Stencil. I watercolored in the stamped image (it was embossed in Metallic Gold Rich Superfine Powder). I inked up the edges with Party Dress to pull in the color. I also played around a bit with a few other powders to create backgrounds for future cards. How great is this combo? I used Earth Tone Blueberry and the Metallic Gold Rich Superfine powders. I added a little Juniper Mist to the background, too. Next up on the hop is Ilina! Very interesting, never thought of using a stencil. Must give it a try! TFS. Love how you used the stencil for the beautiful background. TFS. These are so pretty!!! Fantastic cards! Gorgeous! These colors are amazing! 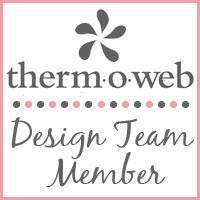 Beautiful card's made with amazing products! Stunning background pieces. I love the use of multiple embossing powders on a card. It really looks fabulous. 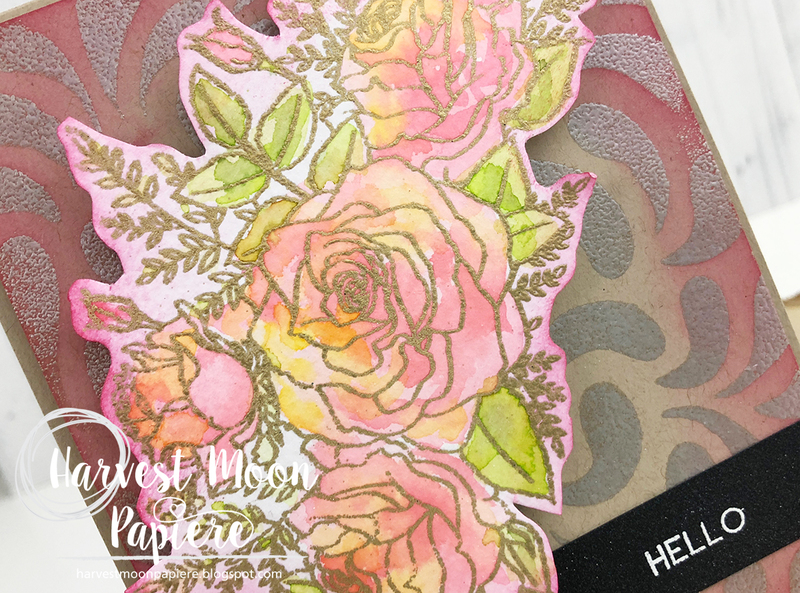 The embossing powders certainly dress up a card! I like your creativity using the stencil. Thank you. What great backgrounds! I love the blue. Beautiful cards and great ideas for me to copy! You clever lady. Good layout with embossing powder. A must try. Your cards are really lovely! Stunning cards and beautiful use of the embossing powders - very creative. mixing embossing powders on the card was new technique for me, thanks. Your cards are gorgeous! Love the embossing. These are two fantastic cards ! Color combos are so beautiful ! I love the backgrounds! The colors are amazing! You have a great eye for mixing colors! I really love all of the backgrounds. Great cards! I really like the color combinations. Nice cards - love the stencil background with embossing powders - have to try that! These are beautiful! 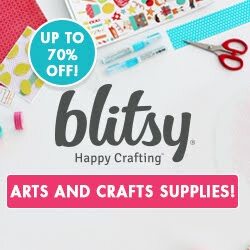 Thanks so much for sharing with us on this fun blog hop!! Interesting backgrounds! Thanks for sharing. 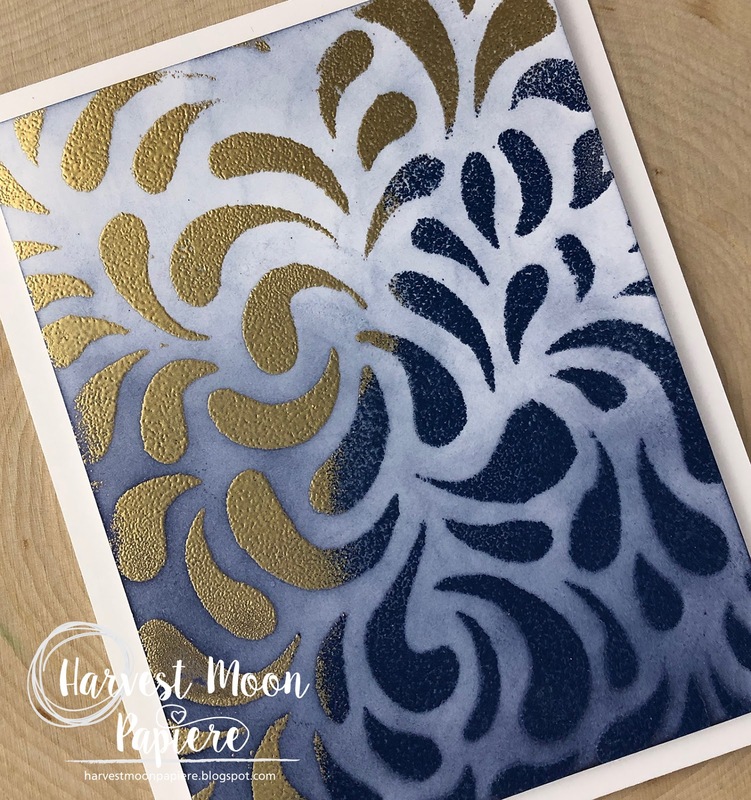 Gorgeous blue and gold card! Both card backgrounds are beautiful. Loving the color combos, especially for the background for future use! Very pretty...I love the water coloring. Fabulous cards! Love all the inspiration on the blog hop! so pretty, love party Dress edging the flower die. What pretty cards Chrissie. Love the stamps and the colours of these embossing powders are amazing. You used them well. 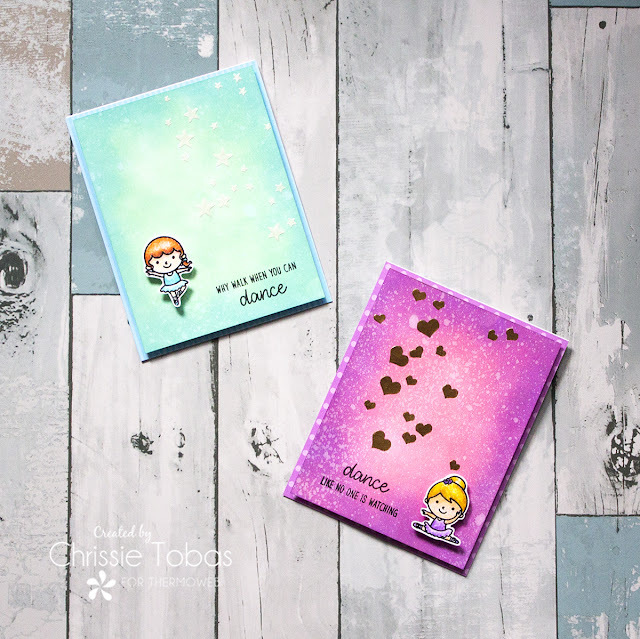 Oh, I love that Swoop Stencil & you've showcased it just beautifully! The background is my favorite! I really like to emboss and then water color the image. I like the Metallic Gold against the colored flowers. Beautiful card! I love the background that you made, so pretty. Thanks for sharing. So much fun sparkle and glitz on your fun cards. Thanks for sharing. Fabulous background for these pretty flowers. Gorgeous cards and loving the background, so pretty flowers. 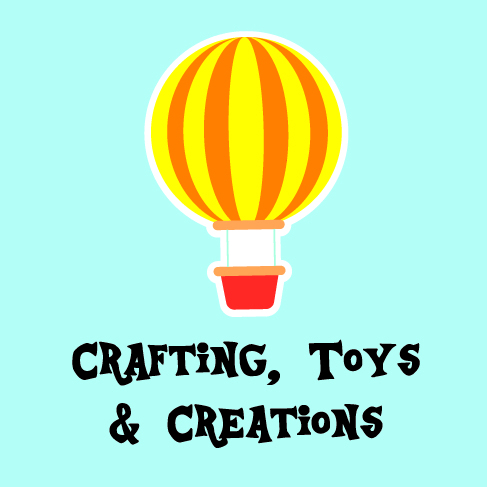 Thank you for being apart of this wonderful Blog Hop! Gorgeous! Especially love the blue and gold. I love your background along with the gorgeous florals. The blueberry & gold is so elegant! Lovely backgrounds. 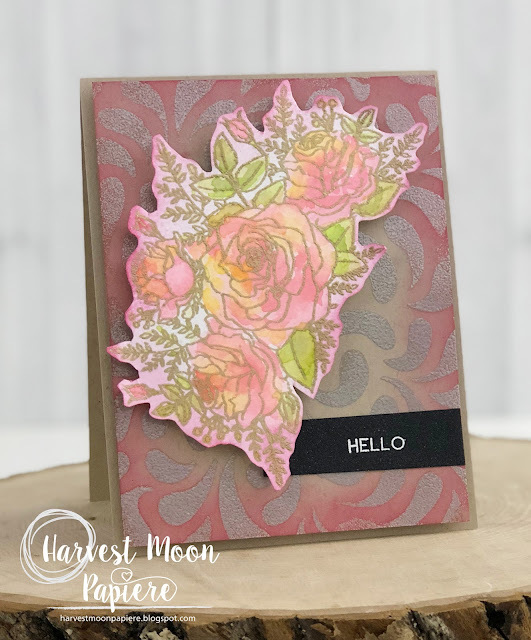 I love the way you used the stencils with the embossing powder - a new technique for me to try! Lovely cards! :) I really like the colors on that second one. I think I need more embossing powders. I particularly like the colour combo on your second panel. Wonderful cards, love the colours used in the first, and the gorgeous background with the multi embossing powders. Great stencil too. Love the colours in both the stamp pads and the EPs. Love the background stencil and the blue card. Lovely card! The background is so pretty with pink ink and silver embossing powder. Your blue background will make beautiful future card. Love the colours. Love the glitters! You are such an inspiration. Love the 2 toned card! WOW...I'm speechless! Just simply beautiful. WOW is right. No pun intended. Very creative and beautiful. Pretty cards - I love how you used the embossing powder - GREAT job. Both cards are lovely but especially like the rose one. Thanks for sharing. awesome cards. Love how different the background looks on the two cards. They are so beautiful! I love those backgrounds a lot. Beautiful card! I love the background too! I tend to forget that you can use glitter embossing powder for backgrounds too! Thanks for the inspiration! beautiful. Your bouquet is gorgeous. Both very pretty cards! 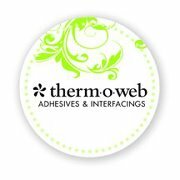 Using embossing powder is so much fun...love to see how it evolves once you add your heat tool!! Both cards are gorgeous! Love both these brands! Pretty cards! I love the Blueberry embossing powder. Such a beautiful colour palette and I love the background you made. Thanks for the inspiration.